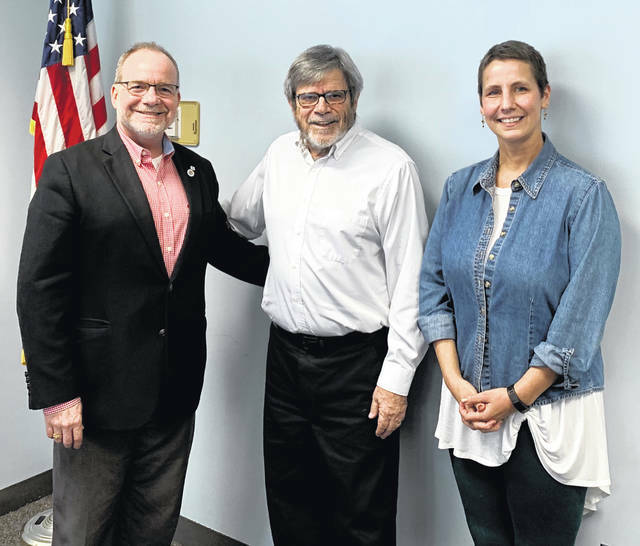 From left are Dan Evers, President of the Wilmington Rotary Club, Professor Ron Rembert, and Katherine Harrison Tigar, President-Elect of the Wilmington Rotary Club. Wilmington College Philosophy Professor Ron Rembert spoke to the Wilmington Rotary Club which meets at noon at Damon’s Restaurant on Mondays. His topic was looking at the Rotary’s Four-Way Test from a philosophy view. 1. Questions are more durable and longer lived than declaratory statements. Plato, 2,500 years ago, wrote Dialogues. It is as viable today as then. There are not answers, but questions of moral concepts. What are courage, friendship and virtue? Dialogues do not provide answers. A commitment to questioning is the most important thing we can do as a person. 2. Questions more than answers are shared universally. Questions bring people together. 3. Questions open the way for wisdom beyond knowledge. Never claim to know more than you know. Professor Rembert then reviewed Rotary’s Four-Way Test: 1. Is it the Truth? ; 2. Is it fair to all concerned? ; 3. Will it build goodwill and better friendships? ; and, 4. Will it be beneficial to all concerned? He posed questions including: Who are all concerned? What is the model of friendship? For the Greeks, all relationships were based on friendship.